Brought to you by the same folks who brought you NoteWagon, a startup that allows students to buy and sell their course notes in an online marketplace, the new company has several people with educational backgrounds involved, including former professors and engineers who have spent time with building classroom technologies. While NoteWagon will still exist, Coursemodo co-founder Saif Altimimi tells me that it will operate separately from the new platform going forward. Currently, that platform includes four key components: a web-enabled application which can be used from any Internet-connected device, including phones, tablets or computers; a polling feature for getting instant feedback from students; a quizzes feature which supports instant grading an export to a teacher’s preferred LMS, and an announcements feature for teacher-student communication which extends outside of course hours through SMS messaging. 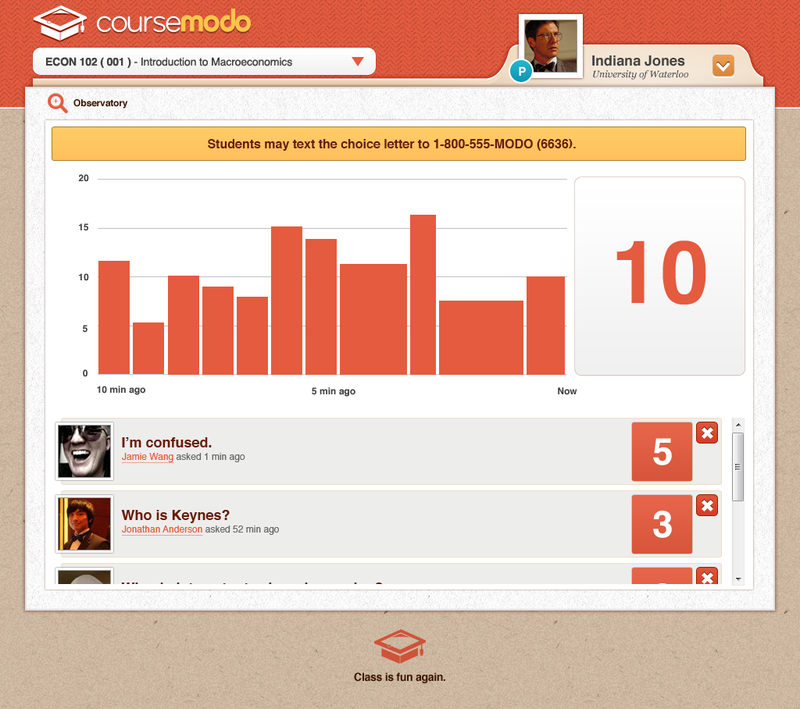 The team has been working on Coursemodo over the past six months, and offered an early trial in five classrooms. During these tests, they saw classroom engagement go up by 35% and grades increase by 4%-7%, Altimimi says. The reason for this is attributed to Coursemodo’s ability to provide a real-time feedback loop for teachers, who can immediately see how students are engaging and where they need more help and better explanations. While the polling feature in the product competes with the likes of Poll Everywhere, for example, Altimimi says the difference with Coursemodo is its focus on higher education. “Something that differentiates us is our core focus on the analytics side,” he says, “allowing the professors to actually get a data stream of how the classroom is performing. This is something we feel is very important, because a lot of these universities function on metrics, and function on accreditation, and making sure our students are really understanding what we’re teaching,” he explains. Plus, he adds, “the cool thing about it is that it’s not a gradebook. It’s a tool that actually syncs with your LMS’s gradebook,” he says. That means it works with things like Blackboard, for example, transferring grades from one platform to the next. The product is now being used in 15 colleges including Harvard, Stanford, Florida State, University of Maryland, University of Florida, University of Waterloo and others, and reaches around 5,000 students. Based on discussions and other agreements, that number is expected to reach 15,000 students by this September, which is around the same time the team expects to ship its iOS and Android applications. Eventually, the goal is to build more apps that sit on top of the Coursemodo platform, and open it up to third-party developers to build on top of, as well. “A teacher should not need to use any other tool besides Coursemodo, that’s what we’re trying to build here,” says Altimimi, who co-founded the company with Gabriel Chan, also of NoteWagon. 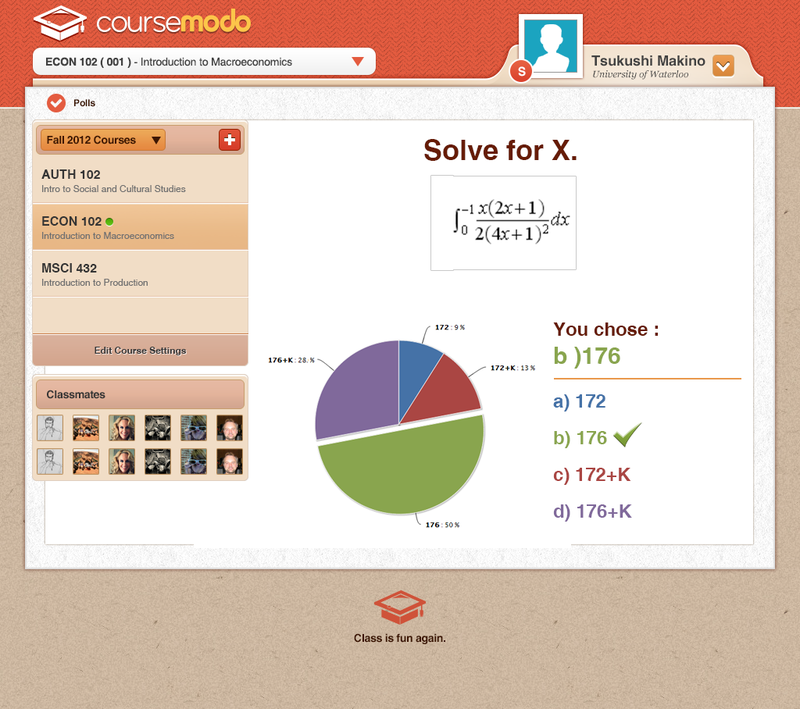 Coursemodo, like textbooks or classroom clickers, is being sold to students, not faculty or administration. It’s free for teachers while students pay either $20/semester or $38 for four years.